Memorials may be made to OLIH Catholic Church. 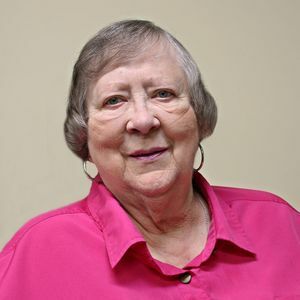 Nancy "Kay" Colton, 84, of Ankeny passed away April 2, 2019 at Mill Pond Care Center. Mass of Christian burial will be 2:30 p.m., Friday, April 5, 2019 at Our Lady's Immaculate Heart Catholic Church. A visitation will be held 1 hour prior to the Mass. Kay was born in Creston, IA to Gerald (Hicks) and Mabel Higginbotham, on September 14, 1934. She attended St. Malachy's School and graduated from Creston High School in 1953. On August 4, 1953 she married Glenn Colton from Holton, KS, and moved to Washington, MO. They lived in several places before settling in Ankeny, IA in 1969. She was a member of Our Lady Immaculate Heart Catholic Church. She has 3 children: Craig, Connie, and Chris. She retired after working many years for Polk County Dept. of Motor Vehicle Registration. Kay enjoyed spending time with family and friends, camping in a motor home, a good joke, going on trips with her lifelong school friends, playing cards, and going dancing (she and Glenn were excellent at the jitterbug) to big band music. Kay is survived by her children: Craig (Cheryl), Connie (Roger), and Chris (Amy); and four grandsons: John, Chase, Brady, and Carson; a nephew (Russ [Roseanne]), and a niece (Ann [Dennis]). She is preceded in death by her husband Glenn in 1988, her parents, her sister Dreda, and her brother-in-law Jim Noonan. Kay was such a fun person. She helped me when I was taking dance lessons, shared her popular music of the times (1950s) with me, and allowed me to be her flower girl when she married Glenn. I am so sorry to hear of her passing. Prayers to her children, their spouses, and grandchildren. I was so sorry to hear of Kay's passing. "Chris's Mom" was always kind to the neighborhood kids. My condolences. My condolences to Connie, her brothers and all the family. I remember Kay from many years ago and always thought of her as a kind, loving mother. Hugs to you, Connie. So sorry to hear of Kay's passing. I worked with Kay at Polk County...she trained me and had so much knowledge to share. We shared a lot of laughs and went to lunch ALOT to Judge Roy Beans on Court Ave. Thoughts and prayers! Prayers to the family. I worked with Kay at Polk County. She was always telling a good joke and was just so much fun to be around. Anne and I send our condolences. So sorry to hear of Kay's passing. We sort of grew up together between Ward family and Snyder family in Creston, Ia and in High School. Had many good times together. Thoughts and Prayers to the Family. So sorry to hear of Mrs. Colton's passing. She was always so sweet and I remember seeing her in church when I went with my Mom. Sending prayers to the family. We know she will be missed. Prayers for your peace during this time.